Obituary – Cutsinger III, Frank Glen « Perry High School Alumni Association, Inc.
Senior Class President 55-56, Junior Class President 54-55, Sophomore Class President 53-54, Home Room President 54-55, Band Queen Manager 53-55, Football Queen Manager 55-56, Wrestling 53-56, Wrestling Co-Captain 5556. ﻿Frank “Brother” Cutsinger III, 56, 1711 Eleventh street, died at 8:30 a.m. Saturday, July 22, 1995, at his home. Graveside rites will be at 10 a.m. Wednesday at Grace Hill cemetery with Rev. Ed Wunderlich, pastor of Zion Lutheran church, officiating. Arrangements will be under direction of Brown Funeral home. Memorials may be made to the Judith Karman Hospice of Stillwater or the First Presbyterian church of Perry. Cutsinger was born at Perry, Aug. 18, 1938, the son of Frank Cutsinger Jr. and his wife, Hazel. He was a 1956 graduate of Perry high school where he had served as president of his sophomore class, 1953-54; junior class, 195455; and senior class, 1955-56. He also served as home room president, 1954-55; band queen manager, 1953-54; and football queen manager, 1955-56. 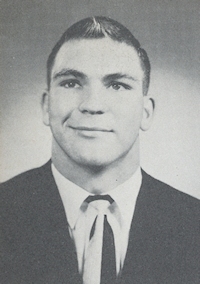 He wrestled for Perry high school from 1953-56 and served as co-captain of the mat team in 1955-56. As a senior, Cutsinger wrestled at heavyweight and took third in regional action and fourth in state. Cutsinger and the former Willetta Wooten were married on July 10,1971, in Perry. He worked as a dispatcher for an oil firm and trained game roosters. In addition to his wife, of the home, survivors include two sons, Steve Cutsinger, Broken Arrow, and Avery Reeder Jr., Perry; two daughters and sons-in-law, Merlene and Mike Wolfe, Ada, and Dada and Steve Ritter, Mulhall; his parents, Mr. and Mrs. Frank Cutsinger Jr., Perry; one sister, Sally Wisenbach, Muskogee; and six grandchildren, Tahra Emmons, Travis Ritter, Lindsey Reeder, Chase Reeder, Mitch Wolfe and Michala Wolfe.